We used to eat Sloppy Joe's all the time while growing up. It was seriously one of my favorite meals and my mom always served it with Velveeta Mac and Cheese. The two just seemed to go together perfectly. Now I have nothing against Manwich Sloppy Joe Mix, I don't hate it all but it is pretty processed. I got to thinking maybe I could make a healthier version. My sister recommended this recipe and it blew my mind. So much better than the canned kind. It tasted so fresh and full of flavor. I won't ever go back to the Manwich kind. This honestly took no time to toss together and you could even save time by dicing the vegetables earlier in the day. And in case you are wondering yep I served ours with Velveeta Mac and Cheese just like Mom did because somethings are meant to be together. This is a meal that will definitely be on regular rotation in the Mason Household! Heat oil in a large skillet with straight sides. Add the bell peppers, onion, and garlic. Saute until tender, about 5 minutes. Season with salt and pepper. Add the ground beef to the vegetables. Stir and cook about 8 minutes, until the meat is no longer pink and fully cooked. I added a little salt and pepper at this point. Add tomato sauce, tomato paste, barbecue sauce, Worcestershire, ketchup and hot sauce into the skillet. Stir. Simmer until thickened, about 10 minutes. Serve on hamburger bun with extra sauce. Love this because it doesn't have brown sugar in it! I don't like my sloppy joes to be sweet. Will definitely try. Thanks! Also, ordered a bunch of Old Navy bathing suits yesterday. I got some last year and they held up great! There s nothing better than a good sloppy joe. I use a Bobby Flay recipe that has like 62 ingredients but it is worth it. Thanks for the recipe sloppy joes are one of my favorite "kid" foods to eat but the fact it usually comes from the can turned me off. Can't wait to try this version! And the fact it's from The Neely's make it even better! Yum that looks super tasty! We'll definitely try it! I still make the Manwich kind (bad mommy). We serve ours with tater tots. There's already plenty of veggies in Manwich so we don't need a side vegetable. ;) Ha! Watering mouth alert! 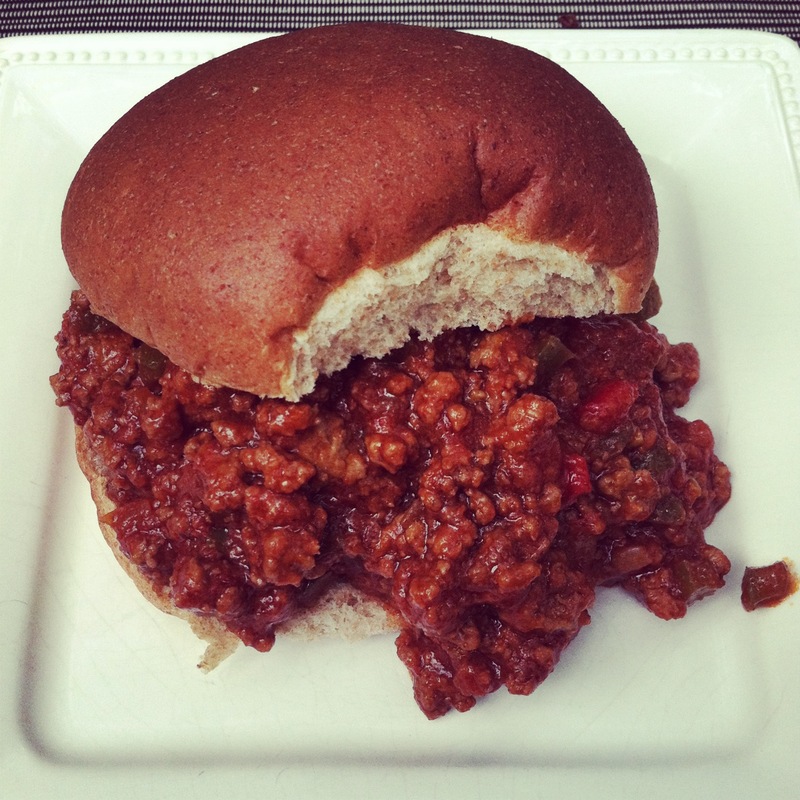 Another good sloppy joe recipe is Ina Garden's Sloppy Joe's! Buying ingredients right now for Amy's Pad Thai. Better add Natalie's Sloppy Joe's to the list! whatever happened to The Neely's? I used to love watching them on food network. Love me some sloppy joes! I have been dreaming of this since you posted it on instagram! Looks delish and I will def be making! This is one of the ultimate comfort foods, no matter how old you get! Looks awesome! I made these tonight Natalie, and the hubby loved them!! They were so good! Thanks! I can't wait to try this it looks delicious. Thanks so much for sharing!! !